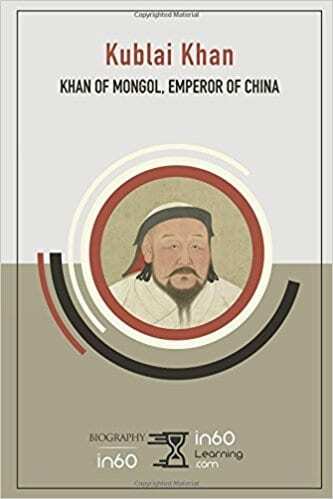 Kublia Khan: Khan of Mongol, Emperor of China is part of a new series of non-fiction historical books by in60Learning. The idea behind these books is to "...produce concise historical and biographical works that can be read or listened to in 60 minutes." This book, and its new format have definite pluses and minuses that overall, make it a book worth investing 60 minutes of your time. This extremely short book is similar to the long entries found in some encyclopedias. It is only 37 pages long and many pages are only partially used. There is no author (or authors) listed, but a short bibliography of source material is included. The author(s) does do a creditable job of producing a summary of Kublai Khan's life and accomplishes. The book describes the Mongolian empire at the time of the death of Genghis Khan, Kublai's grandfather. It covered most of eastern Asia, but did not include southern China. The Mongols did not have any method of determining inheritance and the many descendants of Genghis fought amongst themselves for power. During this time, Kublai was a boy and well protected by his devoted mother. She also saw to it that he was well educated. As a young man, he held various minor posts until his brother, Mongke, died and he became the supreme Khan over all the areas ruled by the Mongols. The Mongols had already conquered northern China. This is where Kublai built his fabulous palace, Xanadu, and surrounded it with miles of game parks. At that time, the rich lands of southern China were ruled by the Song Dynasty. Kublai's great achievement was conquering them, but he had to fight many bloody battles to take over their land piece by piece. His greatest failure was the abortive battles he fought in his attempt to conquer Japan. Given its length, this short book is an excellent biography, but it does have a few flaws. Many of the chapter headers include a quotation or poem which illuminated the text, but some illustrations would also help enliven the story, or perhaps some photographs of the lands discussed in the book - it would also be a good use of some of the empty space on various pages. The text did need better proofing - the numerous sentences with extreme spacing were irritating. Overall, it's a good start to a new series of educational books. Quill says: A concise biography which gives a good overview of Kublai Khan.